John writes of the disgraceful dismissal of one of the world's leading noise researchers, joining a growing line of excellent scientists sacrificed by the religion of man made global warming. As you probably know, a passion of mine is defending my profession (Science) from assault. We now have yet another distressing example, where a leading scientist has lost his job — apparently for the crime of being a conscientious, competent academic, focused on quality research (instead of chasing grant money). Dr. Henrik Møller, is an world-renown expert on infra-sound, and has published several high-quality studies on low-frequency acoustics (like here, here, here, and here). More recently, some of these have dealt with industrial wind energy noise (e.g. here — which was peer-reviewed). He has been praised as Denmark's "leading noise researcher." What’s even more important is that he has been courageous enough to have publicly spoken out against poor government policies, as well as the misinformation disseminated from the wind energy cartel. — Dr. Møller has had thirty eight (38) years of distinguished service for Aalborg University.
) During the last year he may not have produced that much income, but in many other years his work resulted in substantial profit to the university.
) Statistically, approximately half of the faculty would be operating at a loss — so why single him out?
) In his prior 38 years of employment, and reviews, he was never informed that his job was solely dependent on outside funding.
) Additionally, prior to the sacking, he had not been informed that his income production was a problem that need to be addressed — giving him a chance to do so. — The VP of the Danish Confederation of Professional Associations stated that it's rare that a Danish professor is fired. — Consider this: the same Dean Nielsen was a keynote speaker at the Wind Industry Association’s meeting, the day after he fired Dr. Møller! 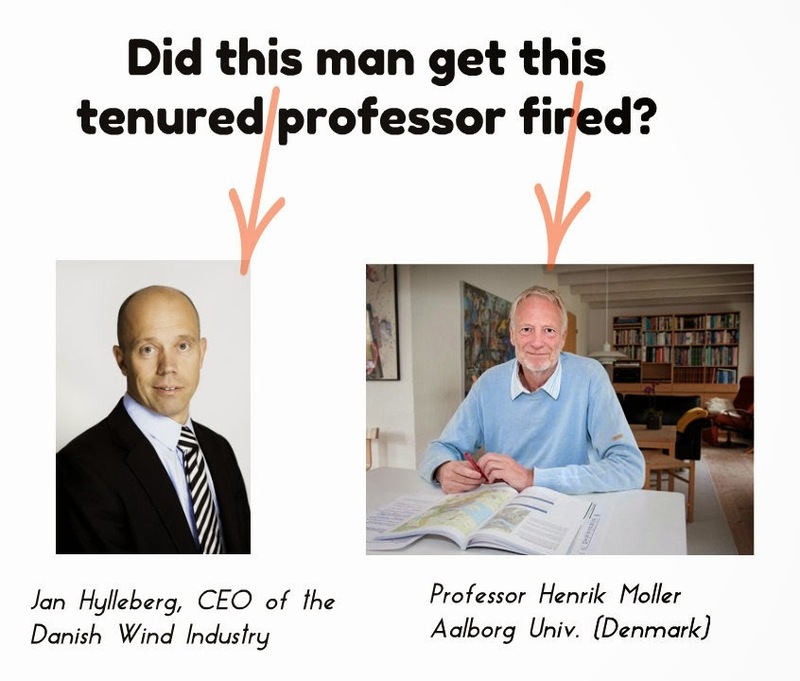 — As one article explains, this termination might have also come from the fact that the Technical University of Denmark (DTU) has a very close association with the wind industry, and that Dr. Møller's scientific research had resulted in embarrassing revelations. As one report accurately stated: it takes courage for academics to focus on scientific research, instead of pursuing outside funding. Please consider writing a short, polite email to Dr. Møller's boss (the person who fired him), Dean Nielsen (dekan-teknat@adm.aau.dk), objecting to this shameful termination. PS — Although his studies on industrial wind energy only comprise a small amount of his thirty eight years of academic work, they may have resulted in the most notoriety. We made an analyses of a wind project in Maastricht, planned to possibly have turbines from a Danish company. The City Council stopped the project after our report — a result that did not make us popular with the Danish wind industry. A reason why we seem to be a nuisance to the wind industry in Denmark is that we keep finding errors in noise calculations and evaluations. As an example, we found serious errors in the environmental impact assessment behind a new law on a wind turbine test center, and the law had to be changed. We also revealed that in a big Vestas promotion, they mixed up two acoustical terms (and Vestas had to change part of their campaign). I’m afraid there are only Danish newspaper articles about that — which is unfortunate, because it was quite funny. We also criticized Danish regulation of wind turbine noise, which resulted in feature articles in Danish newspapers. I am not sure if others have been translated, but here is one example. We also put together some web pages about the Danish wind regulations, which made the wind industry complain about me to the Dean (again).